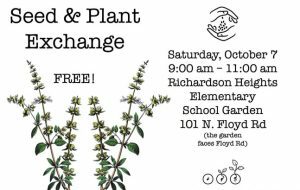 Fall planting season is here, and Richardson Heights Elementary PTA invites you to its Seed and Plant Exchange from 9 to 11 a.m., Saturday, Oct. 7 at the school garden. Come share seeds and seed starts, bulbs, plant cuttings, transplants and more. Meet neighborhood gardeners and exchange gardening tips. Envelopes and markers will be provided. Everyone is welcome, even if you don’t have any seeds to bring. For more information, email gardens@rhepta.org. The blue and red lines represent the participating blocks. The circles are where the parties will be located. National Night Out is nigh upon us! Here are the participating blocks. Join your neighbors from 6 to 8 p.m. on Tuesday. Generate support for, and participation in, local anti-crime programs. Richardson Police officers will visit registered parties and collect can food donations for its “Can Do” project. Talk about your fall classics. The Heights Park Neighborhood Association has treated the neighborhood to OktoberFest for quite some time. But, just as the trees are shedding their leaves, this festival is shedding its former format for a fresher, frothier, more fun fall festivity. Say that fffffive times fffffast! This year’s festival will be at 5:30 p.m., Saturday, Oct. 21, on Thompson Drive between Newberry and Greenleaf. It will feature a Chili Cookoff judged by those in the know. Residents are encouraged to whip out their biggest pot and bestest recipe and enter the contest by sending an email to contact@heightspark.com. Prizes will be awarded for the top three tastiest treats. If you don’t cook, just come and chow. And don’t forget to bring the beer — after all, it is OktoberFest! Heights Park Neighborhood Association will provide all the fixins, hot dogs, and root beer for those teetotalers. Come kick off fall with all your neighbors. 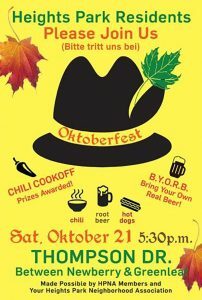 For the latest information, visit the Heights Park OktoberFest Facebook event. Sign up to enter by emailing contact@heightspark.com. Contestants must have a crockpot and prepare enough for neighbors to enjoy. Chili participants need to arrive at 5 p.m. Judges at 5:15 and party starts at 5:30! A strong school like Heights Elementary School makes our neighborhood stronger. And a strong neighborhood like Heights Park makes a school stronger. Located at the corner of Belt Line and Floyd, Heights Elementary opened in 1956, the same year many of our homes were built. It plays an important role in our neighborhood. Whether you are a Heights Elementary parent or taxpayer, the school is part of all our lives. And the school needs our support. The Heights Elementary PTA is launching its Heights Community Campaign fundraiser on Sept. 18. Running through Oct. 20, the campaign will help finance Heights PTA operations for the upcoming year. The goal is to raise $10,000 (equivalent to $20 per student). One-hundred percent of your donation benefits students and 100 percent is tax-deductible. Donations will help fund student programs, curriculum enrichment, learning support and subsidize the STAR Teacher Fund. Funds also will help cover items such as school supplies, field trip expenses and books. 2. Donate online via PayPal at rhepta.org/fundraising.html. Click the “Donate” button and be sure to include your name in the “Special Instructions” section. 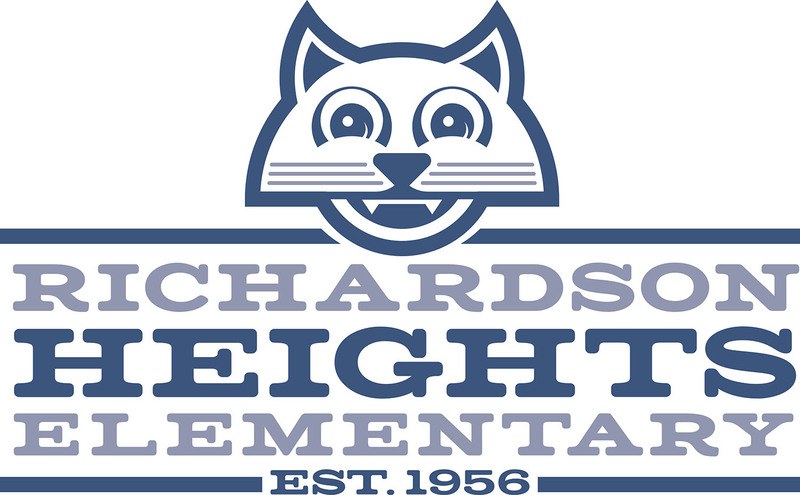 To learn more about Heights PTA, please visit us at rhepta.org or email Lana Shvarts at CommunityCampaign@rhepta.org. Heights Park is a relatively safe neighborhood. But crime can and will strike anywhere. Even here. Earlier this month, delinquents broke two cars’ windows on Twilight Trail. 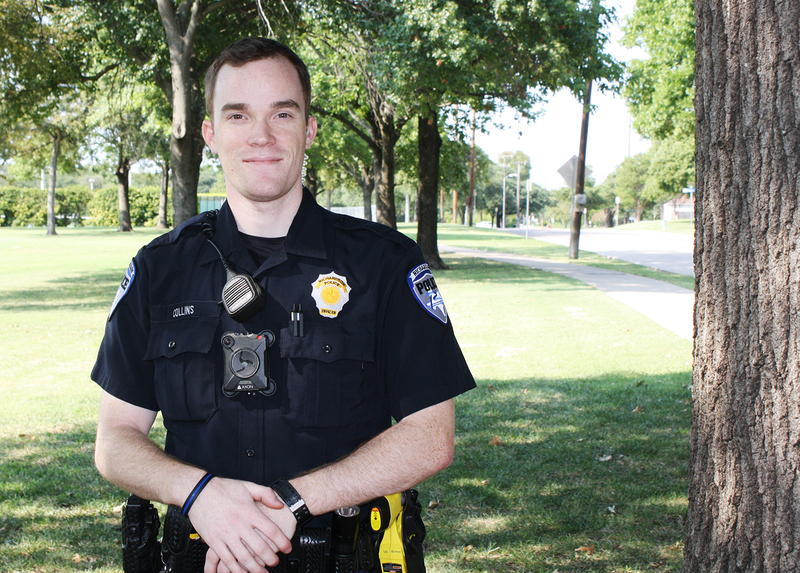 Officer Kevin Collins, who recently relocated from Austin to join the Richardson Police Department, is among the officers who patrol our neighborhood. He said that concerned neighbors are critical for crime prevention. Get the ball rolling by introducing yourself to your neighbors while they are doing yard work or walking around the block. Share your phone numbers with each other, and offer to look after each other’s homes when you are out of town. The Richardson Police Department also offers a service for residents when they are away, Collins said. “When going out of town, contact the Richardson Police Department and sign up for our Home Security Watch program to prevent criminal opportunity while you are away,” he said. Follow Richardson Police Department’s Home Security Assessment Checklist to reduce criminal opportunity. Become a member of your community on Nextdoor to keep updated on current events. Get involved in your local neighborhood watch program. Keep an inventory of your valuable item — electronics, jewelry, guns, anything with serial numbers, etc. Visit the Property Inventory Program website for details. Collins also recommends investing in a home security system. Not only does it deter criminals, but it also offers homeowners piece of mind. In particular, he says pairing a security system with security cameras is a wise investment. He also said that real-time alerts are a must. According to Collins, the most-common crime in the Dallas-Fort Worth area is burglary of vehicles. The simplest solution for not falling victim is parking your cars in your garage. If that’s not an option, he said consistently locking your car doors and removing anything valuable will make it less attractive to criminals. Some criminals set their sights on older residents solely because of their age, Collins said. Often, these criminals will “case” the house or pose as servicemen and knock door-to-door to find their next target. Collins advises residents to not open their doors for unknown or unexpected visitors. One popular service is the Crime Prevention Unit’s free home assessment. Just call 972-744-4955 to make an appointment with an officer who will assess your house and offer advice for improving your home’s overall security. If nothing else, trust your instincts when it comes to preventing crime. “If something seems out of place or you see a suspicious person possibly casing your neighborhood, do not hesitate to contact the Richardson Police Department,” Collins said. 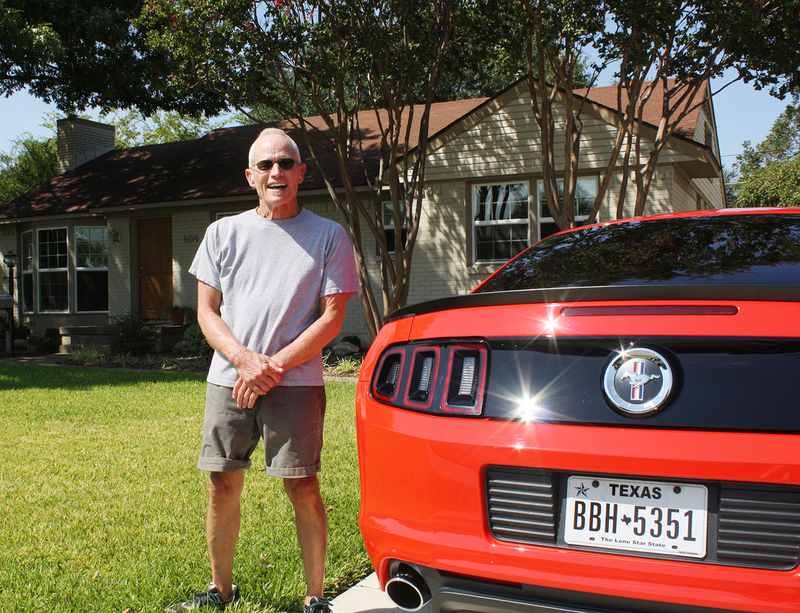 Terry Box, a 32-year resident of the Heights, stands beside his 2013 Mustang Boss 302. “I was fortunate enough to buy a good house and I just try to keep the yard up as one of the Saturday chores. The area is so nice that I want to do my part to keep it that way,” Terry said. For 23 years, Terry Box wrote about the automotive industry for The Dallas Morning News. His loyal readers know him best for his equally informative and entertaining car reviews. His time at the paper — 35 years total — ended last December when he announced he was semi-retiring. Fans who have missed his trademark style can rejoice: Terry continues to write weekly reviews for Jerry Reynolds’ CarProUSA. As neighbors on the 600 block of Ridgedale can attest, Terry drives and reviews a wide array of vehicles. There are often a couple of test cars on display at his house. Terry, a resident of the Heights for 32 years, was nice enough to “put it in park” for a few minutes to answer our questions about living in Heights Park, his background and, of course, cars. I was born in Denton, but I have lived in Dallas for most of my life and graduated from Lake Highlands High School and the good old University of North Texas. I consider myself a homey. What’s one thing you like the most about Richardson/Heights Park? There’s probably not one. For me, the area’s appeal includes good people, great neighborhoods, some fine parks and a slower pace than frenetic Dallas. My blood pressure drops when I cross the city limits into Richardson. What’s one thing Richardson/Heights Park needs and why? As a Libertarian, I’m hesitant to advocate government restrictions or “solutions.” But I hope we residents can keep our neighborhoods healthy enough to slow the movement of tear-downs and over-sized houses I see west of Floyd. Fish City Grill, without a doubt. Fish is basically the only meat I eat and I’ve not found any affordable fish restaurant with the food, the service and the feel of Fish City. Obviously, you are passionate about cars. What other passions/hobbies do you have? As weird as it sounds, I enjoy working out and since my semi-retirement, I spend about two hours or more a day at the 24 Hour Fitness on Campbell Road. I also have returned to regularly reading books — mostly fiction — which I never had the time or energy to do when I was at The Dallas Morning News. Your yard is tidy and has good curb appeal. What’s your secret? I was fortunate enough to buy a good house and I just try to keep the yard up as one of the Saturday chores. The area is so nice that I want to do my part to keep it that way. I believe it’s about 25, but every time I try to count, I seem to overlook one or two. My current car is a 2013 Mustang Boss 302, a limited production track-and-street car that Ford built in 2012 and 2013. It’s my eighth Mustang and it might be my last — though I can’t guarantee that. The exhaust and intake systems have been modified slightly, but are still street-legal. I’m afraid I remain an 18-year-old kid trapped in a 66-year-old guy’s body. How many cars have you driven in your career? I estimate about 600, including my current stint as a reviewer for Jerry Reynolds’ CarProUSA. What’s the coolest/best car you’ve driven? Why was it cool? I don’t have a single favorite because I’ve been fortunate to drive a bunch of really special cars and each had its own highly distinctive personality. But the best ones include a 2006 Ford GT, a couple of thundering Corvette Z06s, a 2017 Mustang GT350-R, two Dodge Hellcats, two Bugattis, three Lamborghinis and a Ferrari California. All could be driven on the street — with varying degrees of difficulty — and were reasonably civilized, but offered performance that was just heart-stopping. What advice do you have for car buyers? First, visit one of the sites like Kelley Blue Book or Edmunds.com and figure out the approximate range of price you should pay. Those sites also have good information on the value of trades and used cars. In addition, my boss, Jerry Reynolds, provides a lot of good information on his website and show. And if people still have questions, they can always e-mail me. I will try to get them an answer. Where do you perform your test drives? Do you have favorite local/Richardson roads? Mostly, I drive them as I presume consumers will. Occasionally, I get up on North Central, but I prefer the Bush and the Dallas North Tollway for speed-work. I have found a couple of unpopulated areas just northeast of us in Plano that are good for handling tests. I always enjoy driving on Waterview just because it’s such a pleasant street; but I make damn sure I’m going 35 mph or less. 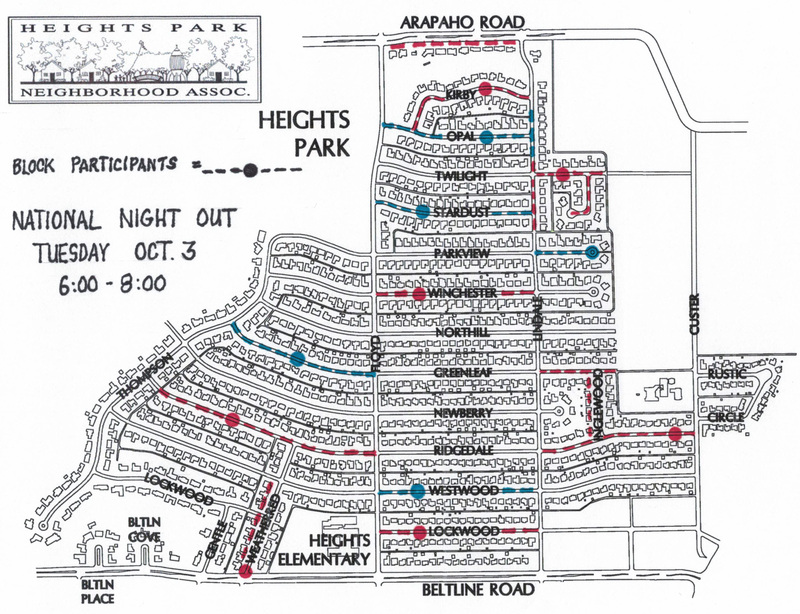 Heights Park Neighborhood Association is compiling a master list of blocks participating in National Night Out, which will be held Tuesday, Oct. 3. We would love to have all streets participate and perhaps have an annual neighborhood “meet-and-plan” party. Your street name and block. Anyone can host/coordinate a National Night Out block party. Traditionally, the events are coordinated by a Crime Watch Block captain, a Crime Watch patrol coordinator or an HPNA block representative. Some blocks do not have representation. We encourage you to start a new tradition on your block and get to know your neighbors. We are here to help you get started. We want to know our neighbors. 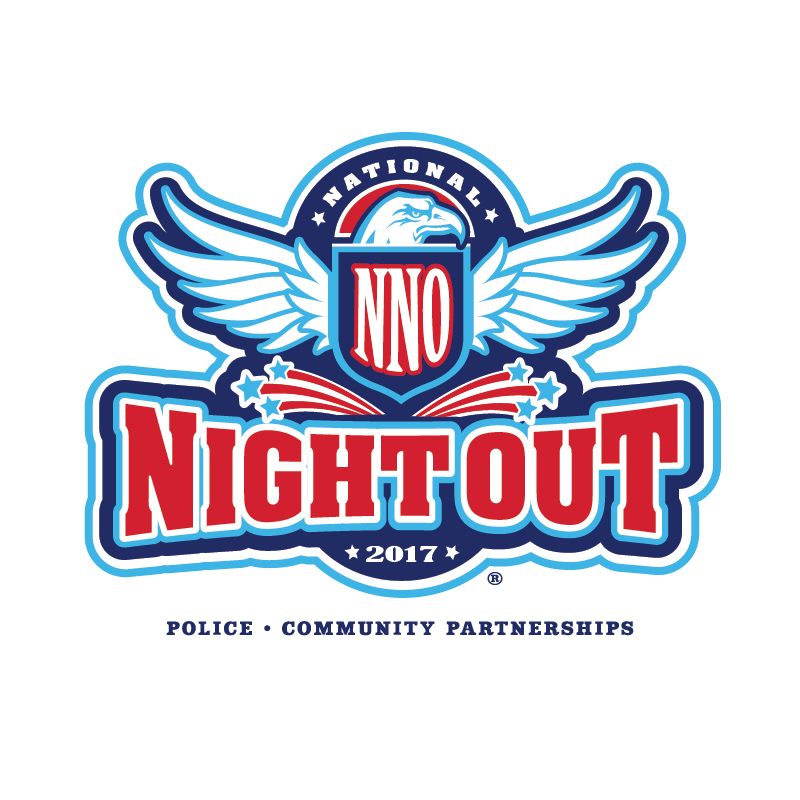 Through National Night Out, we all will benefit through increased communication, crime prevention and more parties. Get started by emailing Marsha Mayo and post your National Night Out Plans on Nextdoor. 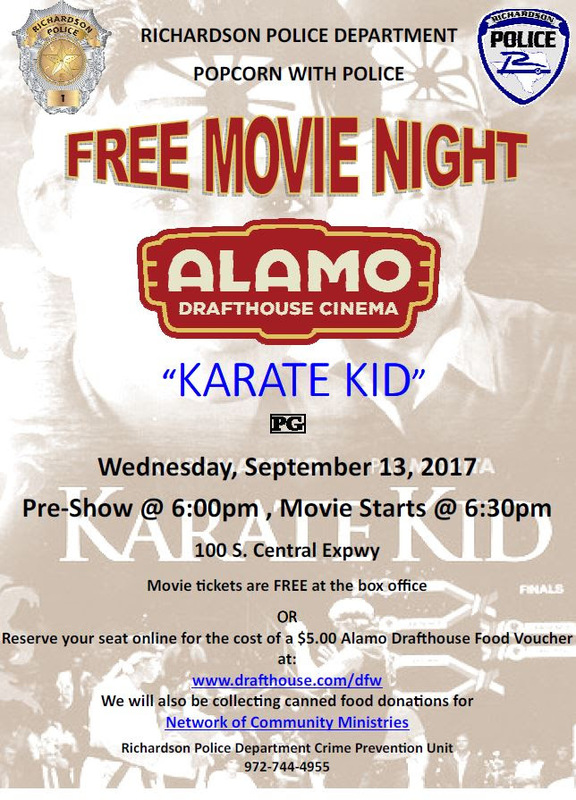 The Richardson Police Department and Alamo Drafthouse invite neighbors to a free screening of “The Karate Kid,” 6:30 p.m. on Wednesday, Sept. 13 at Alamo Drafthouse. The movie tickets are free you can reserve your seat ahead of time by purchasing a $5 Alamo food voucher online or simply show up at the box office that night to get your seat (seating is limited). Officers will be there collecting can food donations for Network of Community Ministries food pantry for National Night Out’s “Can Do” food drive. For more information, please call 972-744-4773.